Orchid | Support Orchid this Christmas with E-Cards. Support Orchid this Christmas with E-Cards. 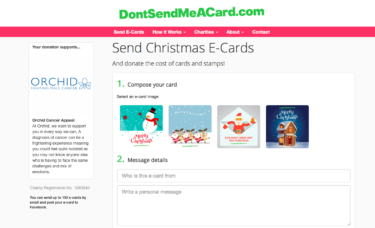 Bring Christmas cheer to your friends and family and support our vital work sending e-cards through DontSendMeACard.com. Sending e-cards leaves you with more time to spend with loved ones this festive season, does your bit to help the planet and very importantly, helps us to continue to fight male cancer. 3. Donate the cost of sending greeting cards to us – helping to raise awareness of male cancers and offering support to those affected. Click here to start making your e-cards!